> > of the Antechamber portal. I agree which I think would be common sense. 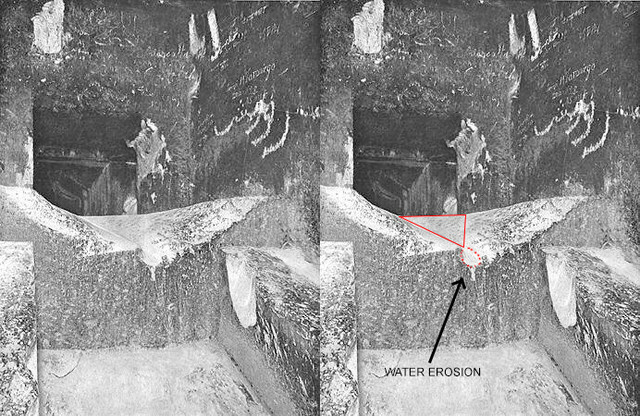 You'll also note the angle of the damage points right at the big chunk missing at the top of the right ledge, but regardless, if such significant wear were inflicted on the step by water then where is the corresponding equally significant wear, or any wear for that matter, to where it flowed to, the right ledge, and the floor of the GG not to mention all along its path? We can also see a lot of vandalism damage to the antechamber entrance which was not caused by "water".